Nothing screams summer rodeo and fair food like warm cinnamon glazed almonds! These sweet, nutty, and crunchy morsels are so fun to pop in your mouth as you enjoy summer festivities. Whether you enjoy them in your backyard as you host a summer barbecue or take them on-the-go when going summer adventuring, they are a perfect snack! Thanks to my momma Elizabeth, who gave me both the nut roaster and recipe, I am able to share it here on my blog with all of you! On the subject of loved ones, this is a perfect treat to gift. 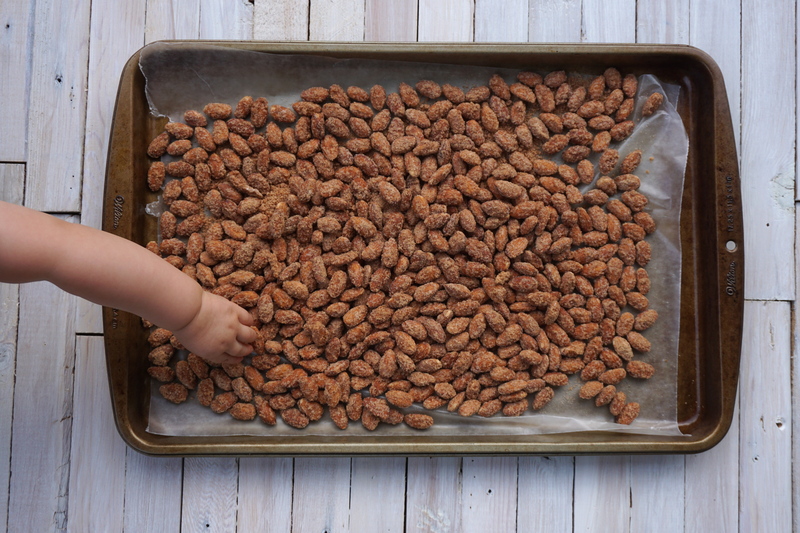 We’ve taken the almonds to new neighbors and plan to give the roasted nuts as Christmas treats to family, neighbors, and friends. The options on who you can give them to are endless! Anyone for any occasion! Non-stick baking tray, parchment paper, or silicone baking mat. Spread almonds evenly in the bottom of the pan. Pour water, sugar, ground cinnamon, and vanilla over the nuts. Turn crank handle to mix the nuts and ingredients together. Place pan on the burner and turn to medium heat. Stir continuously and slowly, allowing the glaze to keep coating the nuts. It is normal for the almonds to slide around at first. The nuts will begin to tumble as the glaze thickens. As the glaze begins to thicken, you will feel more resistance as you stir the almonds. When all the liquid evaporates from the cinnamon sugar glaze, it will quickly change to a crystalline coating. Remove the pan immediately from the heat. Using a heat-resistant spatula, immediately spread the glazed almonds on a non-stick baking tray, parchment paper, or silicone baking mat to cool. Separate the nuts with a wooden spoon as needed. Wait for nuts to cool so you don’t burn your tongue. Enjoy!